Welcome to Hong Leong Yamaha Motor | YAMAHA TRANS BORNEO ADVENTURE 2011 BEGINS! YAMAHA TRANS BORNEO ADVENTURE 2011 BEGINS! 18 Sep YAMAHA TRANS BORNEO ADVENTURE 2011 BEGINS! 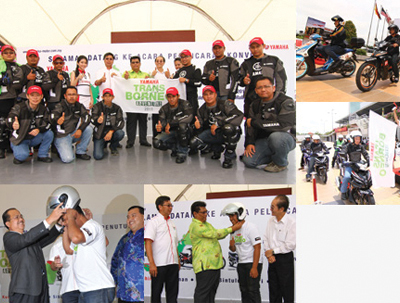 Hong Leong Yamaha organizes first ever Kuching to Kota Kinabalu motorcycle convoy ride. Kuching, 18 September 2011 – Hong Leong Yamaha Motor Sdn Bhd organized the first ever motorcycle convoy ride from Kuching to Kota Kinabalu today. The Yamaha Trans Borneo Adventure 2011 was officially flag-off by En Encik Rano Aylwino Akat, Pengarah, Jabatan Keselamatan Jalan Raya, Negeri Sarawak. The convoy of 12 riders, comprising local and media representatives rode on three different Yamaha models – Lagenda 115ZR, 135LC auto & hand clutch. “This Trans Borneo Adventure will cover a total distance of approximately 1400 km over a period of six days from Sep 18 to 23 with over night stops at Sri Aman, Sibu, Bintulu, Miri, Lawas & Kota Kinabalu” said Mr KC Leong, General Manager, Sales & Marketing of Hong Leong Yamaha Motor. “One of the main objectives of this motorcycle convoy ride is to promote safe riding habits with proper riding attire of safety helmet, riding jackets, gloves and shoes. There will a “helmet exchange” programme at Kuching and Kota Kinabalu whereby unsafe helmets will be replaced with new ones” further added Mr KC Leong. 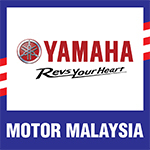 The Pesta Yamaha Trans Borneo 2011 – a fun filled event with Yamaha full product range display – is being organized at Boulevard Shopping Mall, Kuching (Sep 17 & 18) and Suria Sabah, Kota Kinabalu (Sep 23 – 25) in conjunction with this ride. During stops at Sibu (Sep 19), Bintulu (Sep 20) & Miri (Sep 21), Yamaha customers can look forward to a free service campaign, souvenirs and refreshments at specific Yamaha’s authorized outlets besides meeting up with the convoy members.